Ideal for commercial kitchens, restaurants, catering companies. 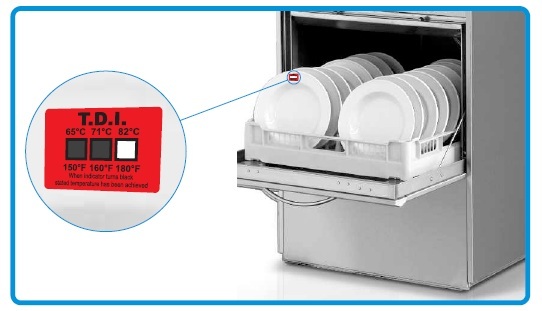 Easy to use label that records the highest temperature achieved. This is a Permanent non-reversible result, which allows the label to be left for a lengthy period of time. 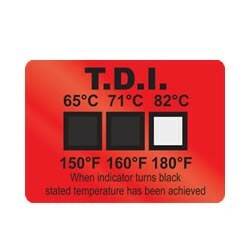 Ideal as part of HACCP procedures verifying that thermal disinfection has occurred which is integral to food safety. A fast, simple temperature monitoring system based on Proprietary colour change Technology. Peel indicator from release paper. Apply to a clean, grease free surface ensuring that the indicator has adhered to the surface. the rating has been reached.